Although the term "humanism" was not applied to a philosophy or belief system until the European Renaissance, those early humanists were inspired by the ideas and attitudes which they discovered in forgotten manuscripts from ancient Greece. This Greek humanism can be identified by a number of shared characteristics: it was materialistic in that it sought explanations for events in the natural world, it valued free inquiry in that it wanted to open up new possibilities for speculation, and it valued humanity in that it placed human beings at the center of moral and social concerns. Perhaps the earliest person we might be able to call a "humanist" in some sense would be Protagoras, a Greek philosopher and teacher who lived around the 5th century BCE. Protagoras exhibited two important features which remain central to humanism even today. First, he appears to have made humanity the starting point for values and consideration when he created his now-famous statement "Man is the measure of all things." In other words, it is not to the gods that we should look when establishing standards, but instead to ourselves. Secondly, Protagoras was skeptical with regards to traditional religious beliefs and traditional gods - so much so, in fact, that he was accused of impiety and exiled from Athens. According to Diogenes Laertius, Protagoras claimed that: "As to gods, I have no means of knowing either that they exist or do not exist. For many are the obstacles that impede knowledge, both the obscurity of the question and the shortness of human life." This is a radical sentiment even today, much less 2,500 years ago. Protagoras may be one of the earliest of whom we have records of such comments, but he was surely not the first to have such thoughts and to try to teach them to others. He also wasn't the last: despite his unfortunate fate at the hands of Athenian authorities, other philosophers of the era pursued the same lines of humanist thinking. They tried to analyze the workings of the world from a naturalistic perspective rather than as the arbitrary actions of some god. This same naturalistic methodology was also applied to the human condition as they sought to better understand aesthetics, politics, ethics, and so on. No longer were they content with the idea that standards and values in such areas of life were simply handed down from previous generations and/or from the gods; instead, they sought to understand them, evaluate them, and determine to what degree any of them were justified. Socrates, the central figure in Plato's Dialogues, picks apart traditional positions and arguments, revealing their weaknesses while offering independent alternatives. Aristotle tried to codify standards not only of logic and reason but also of science and art. Democritus argued for a purely materialistic explanation of nature, claiming that everything in the universe is composed of tiny particles and that this is the true reality, not some spiritual world beyond our present life. Epicurus adopted this materialistic perspective on nature and used it to further develop his own system of ethics, arguing that the enjoyment of this current, material world is the highest ethical good towards which a person can strive. According to Epicurus, there are no gods to please or who might interfere with our lives - what we have here and now is all that should concern us. Of course, Greek humanism was not located merely in the musings of some philosophers - it was also expressed in politics and art. For example, the famous Funeral Oration delivered by Pericles in 431 BCE as a tribute to those who died during the first year of Peloponnesian War makes no mention of gods or souls or an afterlife. Instead, Pericles emphasizes that those who were killed did so for the sake of Athens and that they would live on in the memories of its citizens. Greek dramatist Euripides satirized not only Athenian traditions, but also Greek religion and the nature of the gods who played such a big role in many people's lives. Sophocles, another playwright, emphasized the importance of humanity and the wondrousness of humanity's creations. 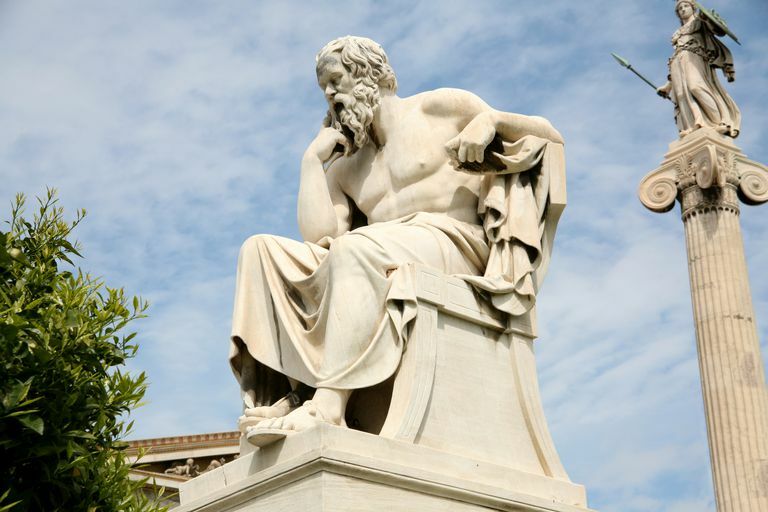 These are but a few of the Greek philosophers, artists, and politicians whose ideas and actions not only represented a break from a superstitious and supernaturalistic past but also posed a challenge for the systems of religious authority in the future. What's the Link Between Ancient Greek Mythology & Modern Religion?